The legislative power of the Northern Mariana Islands will be vested in a popularly elected legislature and will extend to all rightful subjects of legislation. The Constitution of the Northern Mariana Islands will provide for equal representation for each of the chartered municipalities of the Northern Mariana Islands in one house of a bicameral legislature, notwithstanding other provisions of this Covenant or those provisions of the Constitution or laws of the United States applicable to the Northern Mariana Islands. Below are public & local laws by Legislature. 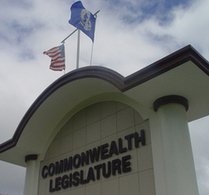 Disclaimer - The information, documents, and publications that are made available over this web site by the Commonwealth Law Revision Commission are done as a public service. While the Commission makes every attempt, within its limited staffing and budget, to ensure the accuracy and timeliness of the content of its web site, there will be times between updates when content will not be current. Also due to the large volume of material, and the technical and manpower demands of converting this material into a form usable over the Internet, portions of such material may be incorrectly inputted, converted, reproduced or transmitted. The Commission, its members, agents, contractors, and employees do not warrant the accuracy, reliability, completeness or timeliness of the content on its web site and each user of its web site relies upon it at their own risk. The Commission, its members, agents, contractors, and employees may not be held liable for any losses caused by any person's reliance on any of the content made available on its web site.